Squeeeeeeeeeeeeeeeeeeee! Look at that nose! If ever I saw a nose that just needed to be glittered and shinyfied, it has to be this one. Look at that adorable little face. Don't you just want to scrunge him? OMG. This is Reindeer Magic, by Krista Heij-Barber, from the October Releases at Whimsy Stamps. You've seen them, right? Now don't you worry UK Peeps, you can get your dirty little mitts on Whimsy Stamps at Dies To Die For. And pay attention to my Disclaimer before you rush over there please. Ahem. By the way, if you tell anyone I've been making cards for That Thing on 25 December We Don't Mention, I will lob a Mince Pie at you. A frozen one. And Yeah, I have them in the freezer already! What a fun image and card - love the night time look of the image background. Fabulous! So enjoy your sense of humor and fun in addition your to fabulous coloring skills. What a happy way to start the day. :) Adore the nose, too. Hi there you little evil temptress :), have you got a site where I can order your colouring skills too ???? Love this card ! And no worries, I won't tell anyone ! Your words always make me smile.... Your cards and colouring make me smile even more... LOVE HIM! You might be looking at the nose, but I am looking at the fur - such beautiful texture, definitely soft and warm! The night sky is perfect! What a sweet little cutie he is Faye, love it! woweeeee. Faye, this is totally wonderful (and you do make me smile)! I have looked at this beautiful card for ages, hoping by some osmosis to soak up your truly exquisite skills. The fur is divine and the sky background just looks amazing...you are FAB. Ditto the above - this one's AMAZING Faye. I love the image but you've made him look fabulous with your colouring. 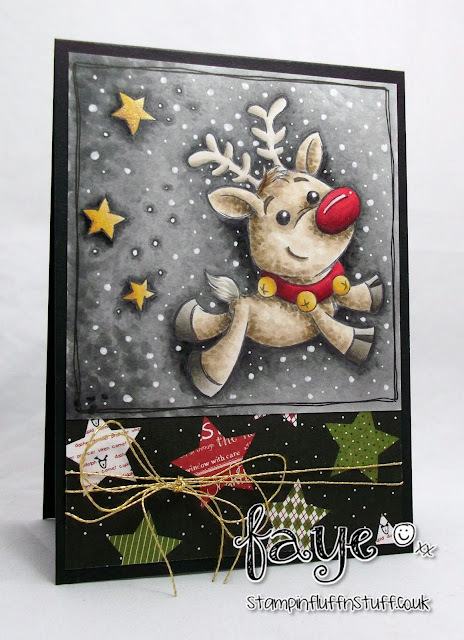 Absolutely fabulous Faye, I love everything about this card, and yes that nose is fabulous!! Such a cute little deer Faye and of course your colouring is stellar! Oh my goodness! Cutest nose ever! 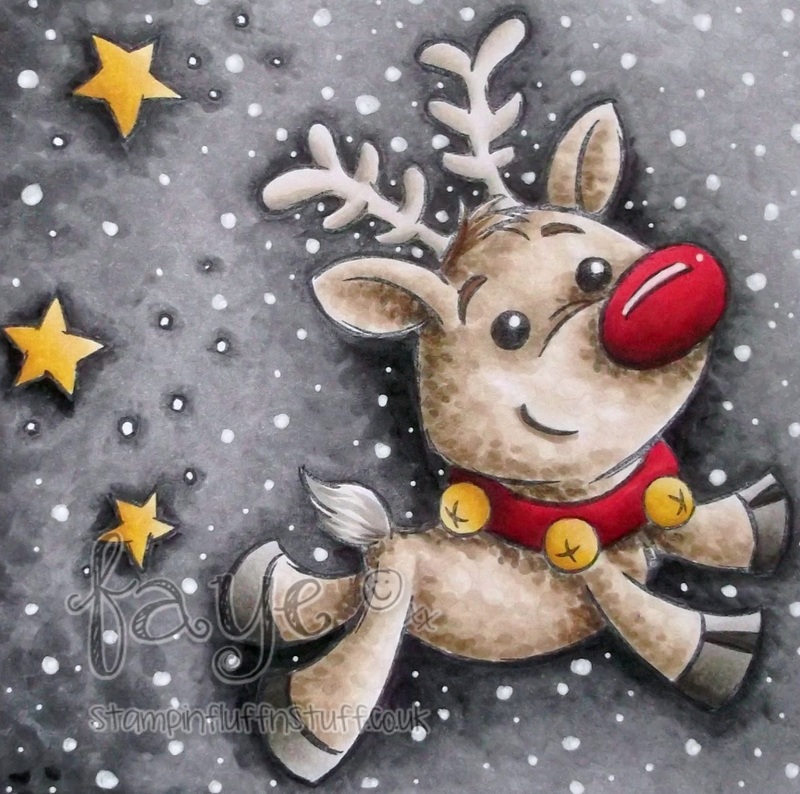 Love this sweet reindeer and your incredible coloring! Wonderful card! And your witty mince pie comments made me giggle! Cute, cute, cute! Excellent coloring and design! Wish I were on your Christmas card list!! Can't but LOVE this cute reindeer and your super design, I know you don't especially like making Christmas cards but you're so great at it! Your design is stunning; the background is out of this world!